You may have noticed (particularly if you are the alumnus of a college or university) that most colleges and schools of higher education have no problem asking for money. In fact, they have a large staff exclusively commissioned to one thing: asking people to give money to the school. Why would a college invest so much in its staff if this work did not significantly contribute to the continued existence and vocation of the college? A college makes that investment in its staff because it knows that asking is the most fundamental step toward receiving the funding it needs to accomplish its mission. What might happen, now, if churches adopted that same posture? What if the church and its leaders believed so deeply in their ministry to the world and knew so plainly that finances were necessary to continue that ministry, that they began to ask unapologetically—perhaps even audaciously—for the resources they needed? One pastor of a small church told us about the day he went to the mailbox only to discover that one of his recently deceased church members had left the church $500,000. He had no idea that a rural church of less than one hundred in average attendance in a small town in Virginia would have a member with that kind of giving capacity. To put this in perspective, that gift was four times the church’s operating budget for the year. Later, the pastor learned that the large gift was only a small portion of the person’s entire estate! He had never thought to ask because he didn’t realize that such giving capacity existed within his church. How have you been asking? I’d love to learn how you do it and help if you’re interested in embracing the ministry of asking. 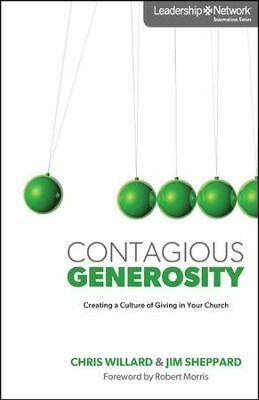 Excerpted from Contagious Generosity by Chris Willard & Jim Sheppard, Zondervan, 2012. Prev Is Stewardship About Fundraising or Discipleship?